My first visit to Colorado was a spring break vacation during high school. Coming from the small hills of Michigan, the massive terrain that Breckenridge had to offer was completely mind blowing. That was to be expected. What I did not anticipate, was the unique culture that surrounded the rocky mountain ski and snowboard scene. My friends and I had all grown up in an area where we were still considered punks for wanting to hit jumps and grind rails on our snowboards. But out here, in Colorado, it was the norm, it was actually encouraged. We did not get evil stares and bad attitudes in the lift lines. Instead, the other snow riders were friendly and happy to share their mountain. We had found our happy place and couldn’t wait to return. I eventually graduated high school and headed straight to Colorado State University in Fort Collins. Not exactly the high country, but close enough to road trip a few times per week (as long as you arranged your course schedule wisely). And, we were able to get huge discounts on season passes to the local resorts, so it was basically FREE to go snowboarding every day! The majority of students at CSU had a ski pass, so there was always a crew to head up and shred with. One day we were driving over Loveland pass to A-Basin, and passed by a large parking lot with groups of skiers and snowboarders hanging out on the side of the road. What was this all about? The driver pulled over in the snow packed lot and we discovered that people were catching rides up to the top and skiing back down. Of course we had to give this a try. So we geared up and all stood next to the highway with our thumbs out. The very next vehicle pulled over and motioned us to hop in. We all piled into the bed of a pick-up truck and sped away. I put my goggles down to block the wind as the punk rock blasted through the air. The driver opened the back window and started chatting us up about snow conditions. Soon enough we were passing around tasty nuggets of snow stories. The sun was shining bright and hundreds of snowy peaks surrounded the rear view. With a huge grin I sat back and reflected on how far away from Michigan I had come. Not really sure that we ever made it to Arapahoe that day. The natural terrain on the pass provided awesome riding and the friendly vibe made it hard to leave. Each car ride to the top we made new friends and elevated that rocky mountain high. One vehicle that stopped was an old ambulance that had been renovated as a shred mobile with gear storage racks and bench seating for guests. We built kickers and launched ourselves inverted into pillows of pow. Many years have passed, and that entire crew of shredders from high school now lives in Colorado. We have full time jobs, and kids, and mortgages, and all sorts of adult stuff. 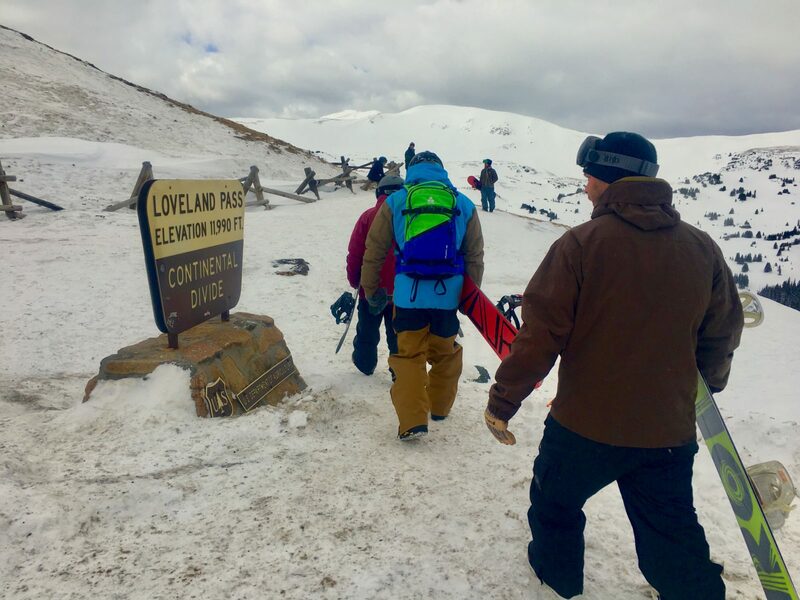 But we still find some time to snowboard together, and this year we all met at that roadside parking lot on Loveland Pass. We put our thumbs out and piled into pick-ups for rides to the top. We hooted and hollered as we flew through trees and launched off of manicured cliff drops. The stoke was high and the folks were too. Happy to be alive and doing what we love. This to me, is classic Colorado.